Capital Safety Services recently conducted industrial hygiene monitoring during the month of April for various clients in Upstate New York. The purpose of the assessment was to quantify either lead, respirable silica dust, and/or total dust concentrations for employees working in an area with suspected air contaminants. Capital Safety Services worked with clients to identify different job tasks that required sampling and then created a custom plan. 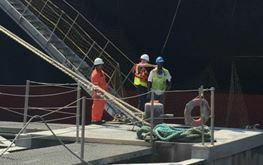 Our professional staff worked seamlessly with clients in areas of construction, maritime and general industry to help them understand sampling techniques, sampling equipment and sampling targets. Personal Protective Equipment, such as respiratory protection, which includes the recommended protection factor and respirator types required. Learn more about how Capital Safety Services can assist you in quantifying and controlling the air contaminants in your workplace at www.capitalsafetyservices.com.